For a mere 6 US Dollars it will be yours. The other Adeline games (LBA2 and Time Commando) will also be available on GOG in the near future. GoodOldGames is a digital distributor that specializes in selling classic computer games. All the games they release have been made to work on Microsoft Windows XP and Vista and do not contain any DRM. So it looks like our effort to get LBA on GOG has paid off. Now everybody will be able to enjoy Little Big Adventure. No biggy, just thought any mention of LBA should be recorded really. More than anything, Soul Bubbles is just great fun to play with – blowing a bubble around has never been more fun. There is surprising depth to its puzzles, and it’s great to see the DS host such a great and intuitive idea again after months of copycat shelf-filler. More of this please, everyone – it’s been a while since we had something this addictive to play on the plane. It's also on Fréd's site. Wii owners in Europe can still download a free demo of the game to their Nintendo DS in the Nintendo Channel. The full game is available for half the original price (so 20€) at amazon. But there's more. Fréd is already working again, this time at Ubisoft, on a "secret project". Stay tuned in 2009. There have been a couple of interviews with LBA's creators over the past twelve months. LBA 3 is still not in developement, but apparently the rights to the project are "no longer a problem". Two years after the initial demo was released, the production of the Twinsen platformer fan-game by .TakaM has stopped. The full version is available for download. Though the game itself remains unfinished, it is still a great game to play for lovers of platformer games. It is the first LBA fan game where a full version was released. While the project was halted this year, the LBA Remake by Jasiek made it to the Dutch press! You can read the article and the translation here. While the big projects who are creating an entire storyline, such as the LBA Prequel, LBA: The Great Rebellion and LID have not been finished this year, the first LBA modifications which each only contain one scene have been created by Inventor. They are the first mods of the game being finished. 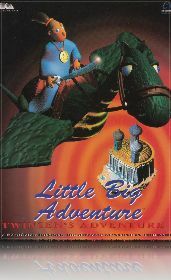 There are three projects you can play when you have the original Little Big Adventure installed on your computer (LBA doesn't work for you? Check our troubleshooting guide!). The modification was made possible by the new LBArchitect and LBA Story Coder fusion into a single program to enable creating scenes, and all the other LBA modification tools by our members. After Inventor's success, member Vindish released his own little modification of LBA 1. It can be downloaded in this thread. LBA Prequel will now run on its own engine, which is currently in progress. LBA Prequel posts updates in the developer blog, including screenshots and commentaries. More awesome fan art is posted in the Fan Art forum. Dino-Fly is voted the most annoying MBN member and is proud of it. Double-J is praised as the almighty God of Annoying. The MBN looks for suggestions how LBA could be called if it wasn't called LBA. LBA 1/2 live speedrunning races are currently being organized. If you can play in early January, check the thread. The current fastest adventurer on Twinsun for LBA 2 is Dino-Fly with a lightning-fast 1 hour and 56 minutes. Vote for LBA & LBA 2 to be released on Good Old Games! I could go on with the usual blah blah about "the LBA spirit being kept alive" and so on. But the truth is, there's a lot of new spirit surrounding our 11 and 14 year old games. A new game by Fréd released and LBA fan games and modifications finally getting released, 2008 was a very active year for our forums. LBA 3 will be coming, guys! Happy new year. Inventor recently released, which can be considered the first mod for LBA1. You can download this mod from this thread. Inventor used various tools released by other MBN members in the past years. Maybe in the future we'll see more and larger LBA mods being released. I've updated the forum software to vBulletin 3.7. Everything should work ok, of course there is always the chance that some things do not work as they should. So if you encounter any problems, or things that used to work but no longer work, then please notify me ASAP. You can reply to this thread with issues, or contact me directly. New forum features are left as an exercise for the reader. How, as a studio, has Little Worlds progressed from 2003? The first activity of LWS was to make, as a contractor, some interactive programs for the DVD format. Then, in 2006, as a response to the increasing demand from the editors, we organized our production line for NDS development. Can you tell us a little bit about the projects you've worked on? Until today we have been developing mainly ordered products. The themes and licenses are various. The studio is capable of great adaptability. The targeted age ranges differ a lot from one title to another, what they have in common is the "accessibility" of the interactive experience. We can say they are "casual" products. What franchise or IP (TV,film etc) would you like to make a dvd game based around if you had the rights? Instead of a franchise or license, I would rather associate one (or more) famous artist(s) to a DVDi project (director, actor, musician...). How will LWS progress and grow in the future? LWS progresses cautiously, step by step. We will continue providing services for NDS games while starting our own projects. If the opportunity presented itself, is LWS flexible enough to collaborate with other studios on projects? We are completely open to this eventuality. I personaly get involved in some other development studios' projects from time to time. Are there any plans for LBA3 in the foreseeable future? So far, there is no precise plan for LBA3. Fred & Yaël are very busy, Seb and me too. But we don't give up on maybe one day starting to create the 3rd part of the game, one way or another. You can download the unfolds and the guide here. As the year starts, a new era of LBA modification begins. LBArchitect and LBA Story Coder can now cooperate to allow an easy editing of scenes. There's only a few left that you'll need to create your own version of LBA 1! Long member and (still) top poster morshem becomes super moderator due to popular request. Congratulations! The MBN gets featured in a Daily Mail commercial. You need a microscope to see it though. To celebrate the 10th birthday of LBA 2, the polish LBA site Planeta Twinsun releases a fan movie ("trailer") of LBA 3. The LBA File Information Project now has its own website (visit it here)! The Ferryman's Song gets performed live. It is now possible to create FLA movies for LBA 1. The LBA Prequel releases its first teaser movie. Well-known member Anakin gets banned for 30 days for posting inappropriate stuff. The MBN celebrates its seventh birthday. Anakin gets unbanned, then rebanned for 10 days after his sockpuppet gets discovered, then the ban is shortened to 1 day. In the end, not much happened, though Anakin was able to promote abortions. After Lightwing stepped down, Kitarii (previously Ricochet) and Jasiek become democratically elected the MBN's new super moderators. .TakaM releases a preview movie of his platformer game "Twinsen". LBA 2 is the best game produced in Continental Europe according to GameFAQs' Top Ten list. While the list is over a year old, we only found out now thanks to CiB. While the year was still quite active, many promised releases of LBA fan projects got delayed and delayed. The latest release of the platformer game Twinsen dates over a year back, the LBA Prequel's demo didn't come yet and the LBA: The Great Rebellion project has similar problems. When #lba titles "2008 will be the year of LBA", it's not because LBA 3 draws nearer (development starts 2009 in the best case). Watch out what the LBA community itself has to offer you next year! You've just found a Magic Flute.